We will speak briefly on the Science of Merkaba. The Science of Merkaba is becoming well know on your planet. There has been building, or ones have been building control systems around this science of merkabah. This control system has been built in a way that has caused many ones to believe that they cannot activate their star tetrahedrons to produce this merkabah without complicated meditations and breathings. These complicated meditations and breathings are very useful for ones who feel they need to be controlled in their spiritual work, in their expansion of consciousness. And these ones usually need some kind of format, or some kind of system to follow, otherwise they may feel that they cannot make any progress through their feelings of unworthiness, and also through their feelings of fear. Now we would say to you it is time to lift this control and give you a very easy, simple way of working with your star tetrahedrons. We encourage you to sit and meditate upon your star tetrahedrons. To set up the counter rotational fields, to set up the counter rotation of your star tetrahedrons in a balanced and orderly way in conjunction with the energies of Love and the energies of Light; and to start working with this all you need to do is sit and affirm 3 times, 9 times 33 times, 108 times, however many times you wish in combinations of threes. That your counter rotating star tetrahedrons are counter rotating in a balanced way. A useful piece of information for you is that you will never get these counter rotating star tetrahedrons counter rotating at exactly the same speed. This is because these counter rotations like everything else upon the earth is governed by the Fibanacci spiral. And the fractions that relate to the Fibanacci spirals. This is why you must affirm that your counter rotating star tetrahedrons are counter rotating in a balanced way. For those of you who don’t know anything what so ever about star tetrahedrons and merkabah, we would say to you that all things manifest have these star tetrahedrons around them; planets, humans, plants, crystals, houses everything that is manifest. Stones, rocks galaxies everything in creation. 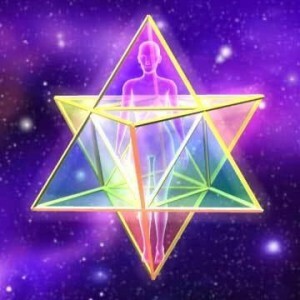 These star tetrahedrons hold the energy field in place through which creation takes place. You have three of them around your physical body. One static and two counter rotating. Your static field is out at the edge of your finger tips and the top point of that field is one hand’s width above your head and the bottom of that field is one hand’s width below your feet. This is the same for everybody no matter how big or how small, how fat or how thin or whatever combinations there are prevailing in your body physical. Inside that space there is another two counter rotational fields which relate to your emotional and mental bodies. The star tetrahedron which relates to your emotional body relates to the right, and the one that relates to your mental body relates to the left. When you speed up the counter rotation of these counter rotating star tetrahedrons to the speed of light, light is the fastest thing in your dimension, when you speed up the counter rotation of these star tetrahedrons to the speed of light you may move multi-dimensionally. The fact is that you may disappear from 3-d. If you are going to work with this technology get focussed, get focussed on where you want to go. Get focussed on where you need to go, because if you don’t, you may find yourself in someplace in time and space, whether it will be in 3-d or higher dimensional reality you don’t have a clue where you are and you don’t have a clue how to get back to where you started from. Of course those ones who are adventurous, those ones who have a pioneering spirit in consciousness will not be interested in where they are going, and also will not have an interest in going back to where they came from. These beings are the true leaders in the revolution of consciousness, they are in the fore front of this movement into Light and Love. Most humans are fixed in the ideas that they live somewhere and that they always have to go back to this place and that this is the only place that they can be. 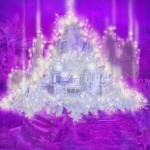 That this is the only place that they can be happy, that they can only be happy in the third dimension. Those of you who are leaders, those of you who are making these trails into multi-dimensional consciousness will not always feel the need to return into 3 -D.
We lay these choices in front of you, we tell you what is possible, we give you ideas with which you can work and what you do with them is completely up to you; because know that free will does operate on planet earth. This free will means that you can do it now, or you can save it for later. Free will brothers and sisters is an illusion. Free will has been given to you so that you may make choice- the choice of now or later. If you make the choice of doing it later, well therefore you will have the free will to have many adventure on the way. You will have the free will to be involved in many things, which you may deem to be pleasant, or you may deem to be unpleasant, the choice is yours. You have free will remember. We have given you some, a few ideas to work with. We will give you one more before you leave. We will ask you to work with this energy of Mahatma. This MAHATMA energy is the pure energy of unconditional love, the energy of the I am presence of the mother/father god. Allow the energy of Mahatma to flow through your heart, in accordance with the will of your I am presence, and speed your journey to freedom. Freedom is your birthright. Freedom is your birthright, and this freedom of which we speak is not the freedom of travel. It is not a freedom of going hither and thither, and moving from one place to another. That is the illusory freedom in 3-D. Freedom is integrating with your I am presence, freedom is realising your multi-dimensional self. Freedom is utilising your merkabah and becoming a space traveller. With those words, we the collective consciousness of the Galactic and Ascended masters will leave you. We would like to thank this being Washataka for giving us the opportunity to speak with you, for giving us the opportunity to perhaps help to speed you on your journey to freedom. We came in love and now we go. We Love you and we care for you because of that Love. And we are always with you. Bless you.